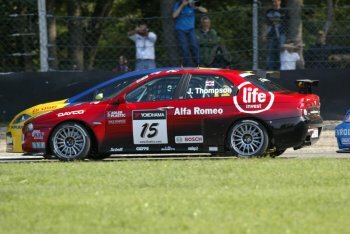 James Thompson and the N.Technology Alfa Romeo team put in yet another very impressive FIA World Touring Car Championship (WTCC) performance, this time at Monza yesterday, and wound up with two podium visits. "This championship is so close that to make the podium twice is immensely satisfying," said Thompson. "As a team we have so much passion we have managed to close the gap in the championship. It shouldn't be underestimated what a task it has been and I'm proud to be a part of it." The twelve points that Thompson collected for his brace of third place finishes yesterday moves him up to fourth place in the FIAT WTCC drivers title fight, and he now has 69 points. This leaves the British pilot still mathematically in the hunt for the drivers' championship, twelve points behind BMW series leader Andy Priaulx (81 points). With just two races remaining, to be contested at the final round in Macau on November 18th, a maximum of 20 points is still on offer. Also ahead of Thompson in the standings is Yvan Muller (SEAT) who has moved onto equal points with Priaulx, and Augusto Farfus (BMW). 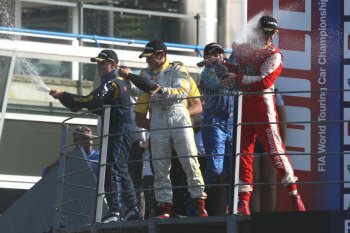 Priaulx and Farfus were the big losers in Monza though, the former scored no points at all while the latter managed just two; Muller meanwhile leapt up the standings after grabbing 14 points. In the manufacturers' championship Alfa Romeo has 111 points, and sits behind BMW (237), SEAT (227) and Chevrolet (194). Yvan Muller was victorious in race one after leading the field for the entire nine laps. 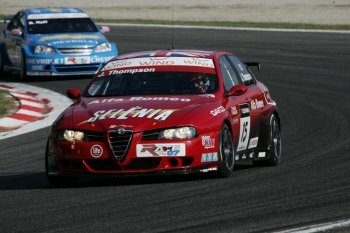 His SEAT Sport team-mate Jordi Gené crossed the line behind him and the podium was completed by James Thompson of Alfa Romeo. The chequered flag came just in time for Muller as on his in-lap he suffered a puncture to his front left tyre. The result enabled the Frenchman to move up to second in the Drivers’ Championship, only four points behind Andy Priaulx. At the first corner an incident involving Andy Priaulx and Roberto Colciago occurred. Colciago hit the back of Priaulx's BMW 320si which damaged its suspension and the reigning champion and current championship leader was forced to retire in the pits. Alessandro Zanardi and Sergio Hernández were forced to stop in avoidance and rejoined at the back of the field. Lap two was the beginning of Thompson's charge from eighth on the grid. The Briton closed in on Chevrolet's Nicola Larini who was lying fourth. At the Curva Parabolica Thompson overtook on the inside line to claim the position. The two then proceeded to chase down third placed Gabriele Tarquini before overtaking him at Roggia on lap eight. Alain Menu from Chevrolet also overtook Tarquini on the same lap. The Italian finished sixth, followed by Augusto Farfus who was the best BMW. There was a final flurry of action between Larini and Thompson on the last lap. They made contact and Thompson was forced to cut through the Roggia chicane but rejoined in the same position. The twelve points that James Thompson collected for his brace of third place finishes yesterday moves him up to fourth place in the FIAT WTCC drivers title fight, and he now has 69 points. The twelve points James Thompson collected in Monza leaves him still mathematically in the hunt for the drivers' championship, twelve points behind BMW series leader Andy Priaulx (81 points). James Thompson and the N.Technology Alfa Romeo team put in another impressive FIA World Touring Car Championship performance at Monza yesterday and wound up with two podium visits. "This championship is so close that to make the podium twice is immensely satisfying," said Thompson. "As a team we have so much passion we have managed to close the gap in the championship. While Larini and Menu finished fourth and fifth respectively, fellow Chevrolet driver Rob Huff passed the chequered flag eighth and claimed pole for race two. Tom Coronel was classified ninth after a brilliant recovery. Luca Rangoni won the independent category and came home tenth overall after resisting strong pressure from Pierre-Yves Corthals. In front of a large crowd Jordi Gené made it two wins for SEAT Sport this weekend, becoming the 11th driver to have scored a victory this season. The Spaniard started seventh but by lap four had captured the lead. Nicola Larini of Chevrolet crossed the line second after defending hard from James Thompson who took his second third place finish of the weekend. Yvan Muller claimed a fifth place and four points that enabled him to join Andy Priaulx on top of the Drivers' Championship. Four other drivers still have chances to secure the world title in Macau: Augusto Farfus, James Thompson, Jörg Müller and Nicola Larini, who are 10, 12, 15 and 20 points behind the leaders respectively. The Manufacturers' Championship is also closely fought, with BMW leading SEAT by ten only points. Farfus' race ended prematurely at the first chicane after he and Gabriele Tarquini made contact. The Brazilian's BMW was sent into a spin, bounced off the barrier and slid across the track, narrowly escaping a collision with the fast moving field. Tarquini retired two laps later. On lap three Larini took the lead from his team-mate Rob Huff. Alain Menu was in the thick of the action and despite reaching fifth, he retired on lap five. Lap four saw Gené promote himself to the front of the pack after he overtook Huff and Larini. Huff then had to defend from James Thompson but it was to no avail as the Alfa Romeo driver took the podium position on the next lap. Huff eventually finished fourth. Alessandro Zanardi and Tom Coronel fought a tough battle throughout the race but it was Zanardi who conquered as he crossed the line 0.046 seconds ahead of the Dutchman to claim sixth. Jörg Müller and Priaulx had a scoreless weekend. Müller's race ended on lap 5 after an incident with Corthals. In a similar scenario as his team-mate Farfus, Müller spun and became stranded on the track. Priaulx's race was somewhat shorter than his BMW colleague's as he retired in the pits after lap 1 after obtaining damage. 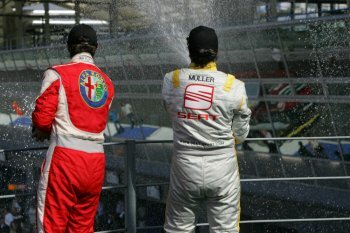 The Independents' Trophy race was won by Pierre-Yves Corthals who managed to win a close fight with Stefano D'Aste. Race one winner Luca Rangoni was involved in a first lap incident and retired. The Championship will resume at Macau, for the two final rounds, on November 18th.